We recently deployed some Microsoft Surface Pro 3s (love these devices) for our Executive team along with some new equipment in meeting / board rooms with Wireless Display capabilities. During testing with my personal SP3 (not domain joined) the wireless display worked a treat, so I expected it to work fine on the ones we would be deploying. After about a week, one of the managers shot me an e-mail saying he couldn’t see the option for wireless display, that night he had performed a reset of the device, came in and had the option, but once we joined it back to the domain, it disappeared. I started digging around Group Policy to see what was causing it to disappear and found that these devices were getting an old “XP” based Wireless Network Policy. I upgraded the policy which then gave us some extra options, including allowing / disallowing Wi-Fi Direct. 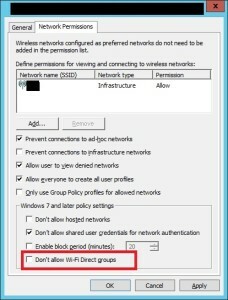 The setting Don’t allow Wi-Fi Direct groups which needs to be disabled can be found under the “Network Permissions” tab. From what I can see, any Wireless policy configured for XP doesn’t have this option and a machine will simply disallow it. How is Miracast or WiDi related to Wi-Fi Direct? Well basically Wi-Fi Direct allows devices to connect directly to each other, without the need for a Wi-Fi AP, which is exactly what your surface is doing when attempting to stream the display straight to a TV / Projector. Once we had this option turned off, ran a gpupdate on the machine and viola, wireless display showed up and began working.